The new issue of Stitch Magazine's "Stitch With Style" is out now. It is packed with clothing and accessories and is a wonderful issue. I love the "Mad Men" sets and style of the photos. Today I'm going to share my Easy Kimono Sleeve Dress. 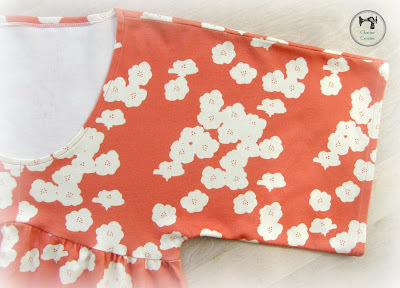 The fabric is from Birch Fabrics Elk Grove Knits line and is the Coral Poppies print. It is such a beautiful "springy" print! I based the design on a top I've worn and loved for many years. It is flattering and easy to wear. It is also super easy to sew and a great first knit sewing project. It has just four pattern pieces. The pattern also includes plus sizes which is so wonderful for curvy gals!!! 1) You can finish the seams with a zig zag stitch if you don't own a serger or overlock machine. Be sure to check your sewing machine manual for other seam finishing stitches. 2) Check your thread tension on a sample piece of the knit you are using. You want to be able to pull slightly without the stitches popping! 3) Use a brand new ball point needle - an 80/12 is a good size for this project. 4) Prewash your fabric as you plan on washing the finished garment to prevent shrinkage. 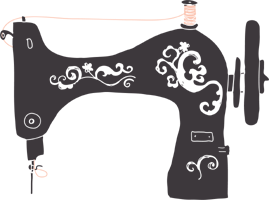 1) Do a muslin or fitting garment to make sure the garment fits correctly and the design lines are in the correct place. 2) Please follow this link for lengthening the bodice if the empire waist line is in the incorrect position. Stay tuned this week and I will share two more projects I designed for this issue! That dress is beautiful Charise! Oh that is such a cute dress Charise!! Love your patterns I have downloaded this one and the maxi dress. Can't wait to sew them! This dress is stunning! I would love to make it! Love that Charise, I have ordered the same fabric and print for a Briar top and now I am going to add your pattern to this pile! oh wow Charise! I paged through my copy quick but didn't know you designed this one! Awesome!!! It's really beautiful. I might just have to give it a go! Hi! I am entranced by this dress, and you say that it's easy to boot! :) I was wondering if it is just for knits or if it would also work with wovens? Thanks! I just made it with a drapey rayon woven (I didn't have the instructions, only the pattern, so I didn't realize it was made for knits!) and it worked fine, if a little snug. I would size up if you use a woven but it should work!